I saw a yard sale the other day while walking across Duluth with my friend Sarah. There were a few old paintings and some other things but I didn’t really take a close look. My motivation to go to yard sales is pretty low these days, particularly since I’m moving soon and have too much stuff already. I kept moving, leaving the potential deals for others. Later on in the day we walked past a dumpster in the same area. There was a big box next to the dumpster that contained a bunch of old clothes. There was more stuff inside the bin, including a bunch of old VHS tapes and colorful embroidered doilies. In recent times they were almost evicted by a new landlord who hoped to bump up their rent drastically, but from what I remember they took the case to court and won. However, the wife passed away a year ago, and the husband is now in hospital and wasn’t expected to recover. The yard sale that I saw earlier contained the last remnants of their possessions. 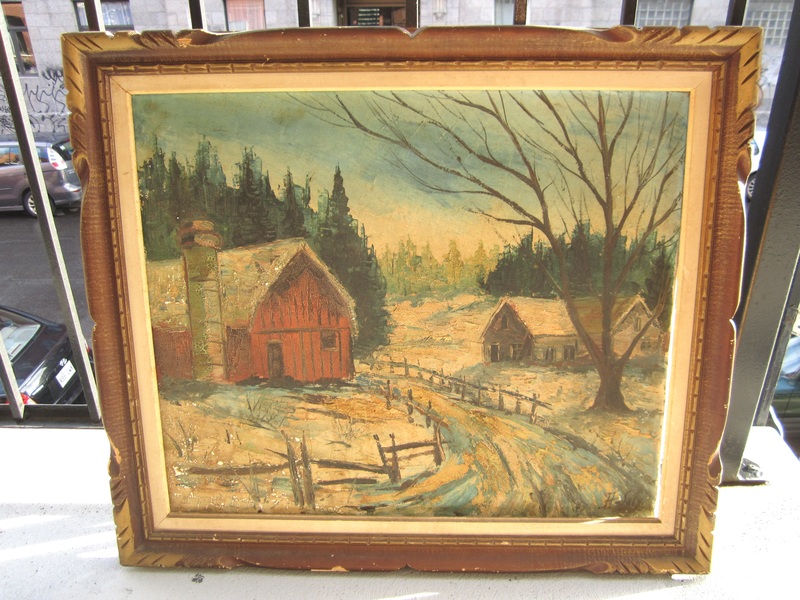 The first thing I saw when I opened the dumpster was this framed painting, the only one that didn’t sell it seems. It’s a nice old landscape piece, signed by someone I doubt is at all well known. The guy we talked to said that he wished he had found it first, and would have taken it if he had. He told us that one room of their house was filled with 15-20 different old paintings of a similar style. I mildly regret not offering it to him now; he appeared to have an emotional attachment to the piece. I’m just a sucker for landscape paintings, and was thinking about decorating my new place. 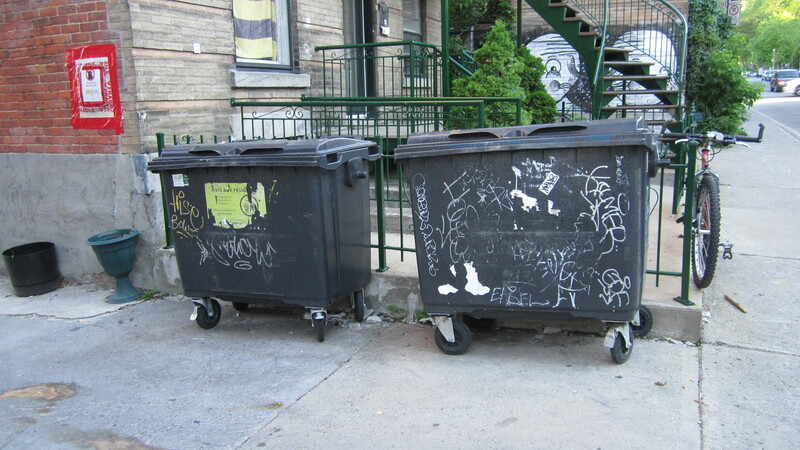 It’s an interesting story, just one of many (the vast majority of which I’ll never hear) that get lost to the curb. This week has been a lot slower than expected. There’s a lot of luck involved in trash picking, and I’m simply not getting as lucky as I was at this time a month ago. I miss those times when it seemed like another great find was just around the corner! 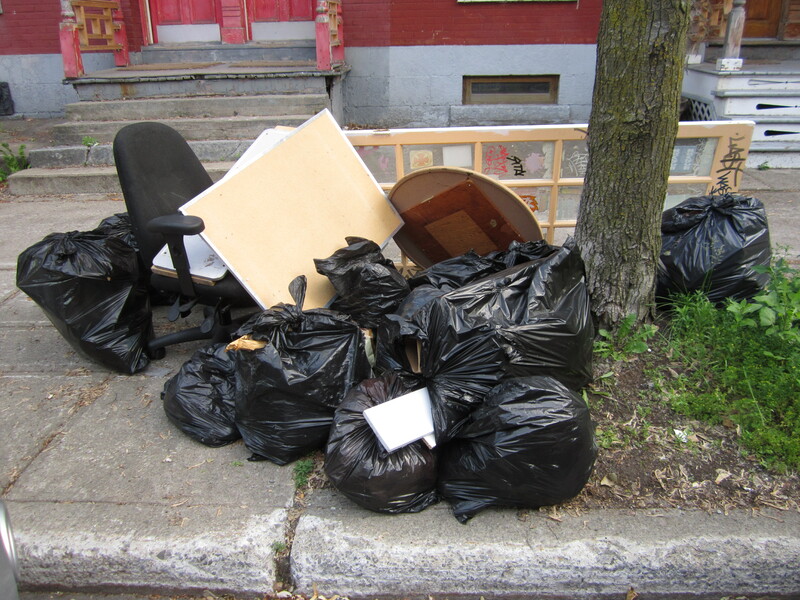 On the plus side, this mini garbage drought has given me a lot more time to pack for my move. Anyways, I didn’t come up totally empty-handed! Well, I did the first three days of the week. 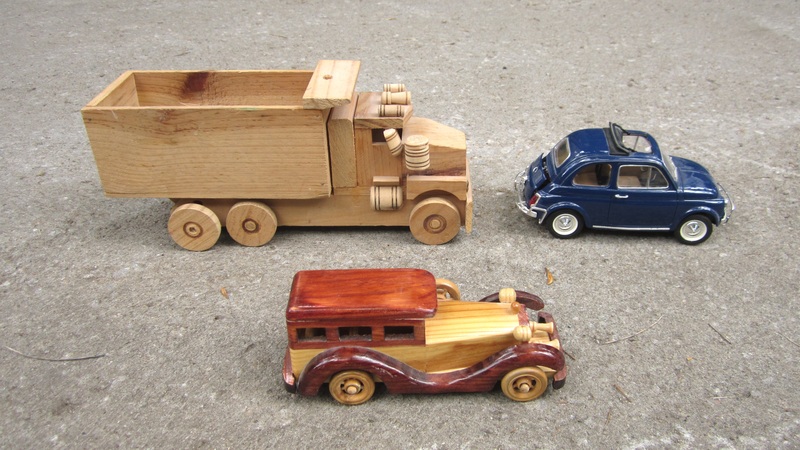 Thursday offered a brief respite when a spot in the Plateau produced a few yard-salable toy cars. Friday was my first passable run, however. I went first to Rosemont (between Iberville and Saint-Michel), a traditionally Quebecois working class neighbourhood. I was joined by my friend Sarah. One spot produced a bit of nostalgia. 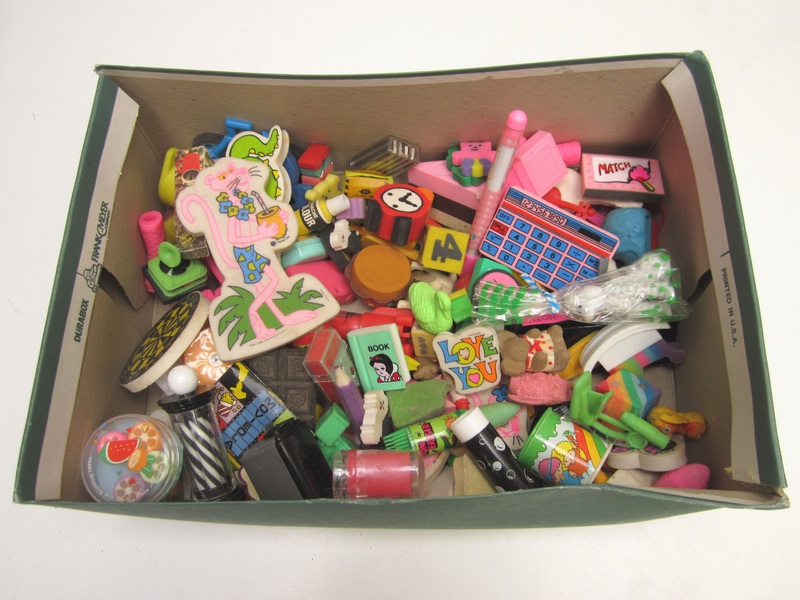 I think anyone growing up in the 80s and 90s will remember these colorful shaped erasers. You might even have collected them, like this person apparently did. They’re not worth much, but I figure they’ll make for fun yard sale material. We came across this spot a little later on. There were buttons strewn across on part of the pile (bottom right). I took the corner shelf, but my favourite find was inside on the bags. 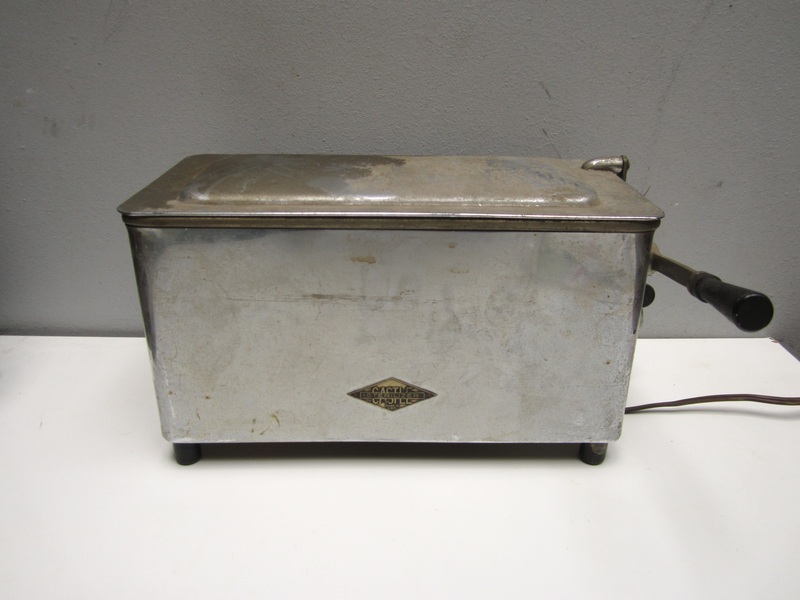 It’s an old medical instrument sterilizer made by a company called Castle. It works fine, though the wiring is a bit sketchy. 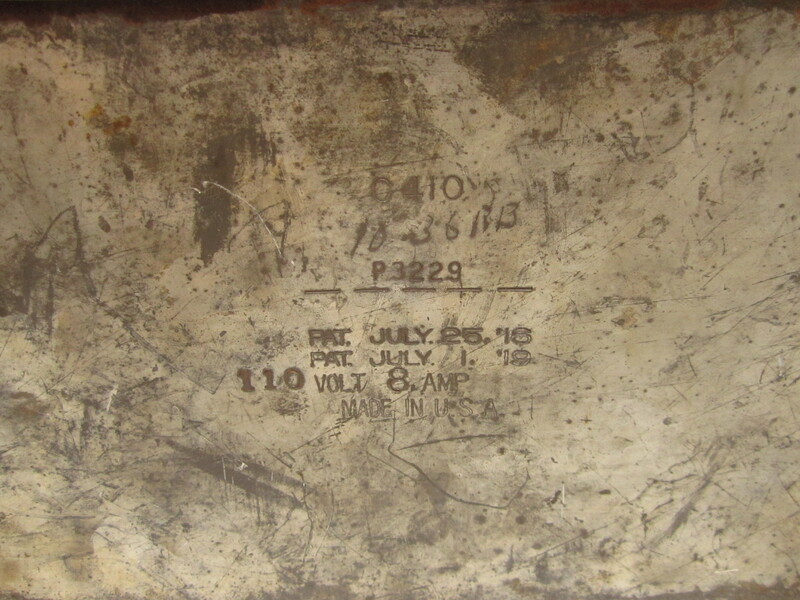 There are two patent dates on the back, one from 1916 and one from 1919. It was pretty grungy when I found it (not gross, just age-related grime) but it cleaned off pretty nice! 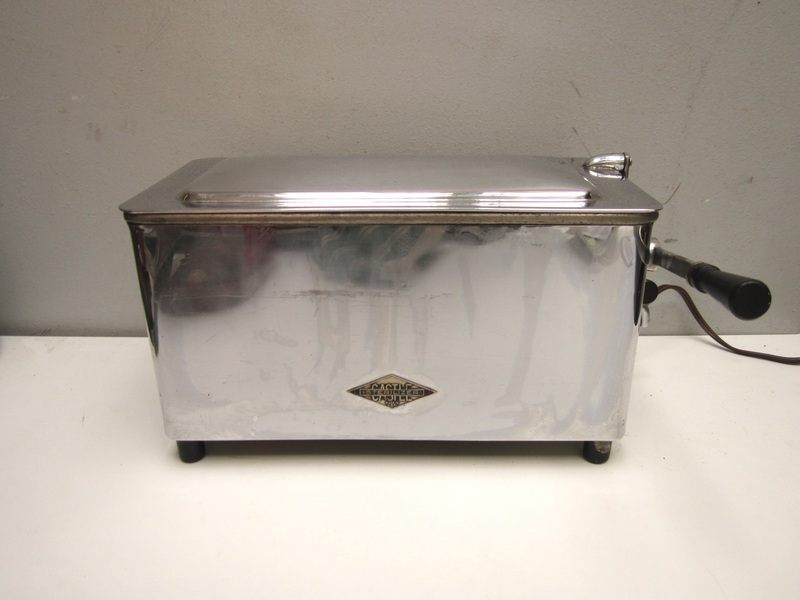 Now I have to figure out a way to get that soap scum off the nice chrome finish… would straight up vinegar work? I don’t think it’s worth a tonne of money (I found one on eBay that sold for 50$ + shipping, and mine is missing its interior tray) but it’s definitely a cool piece. I might just use it as a funky decor at my new place. After finishing in Rosemont we drove to Westmount, one of North America’s most affluent neighbourhoods. 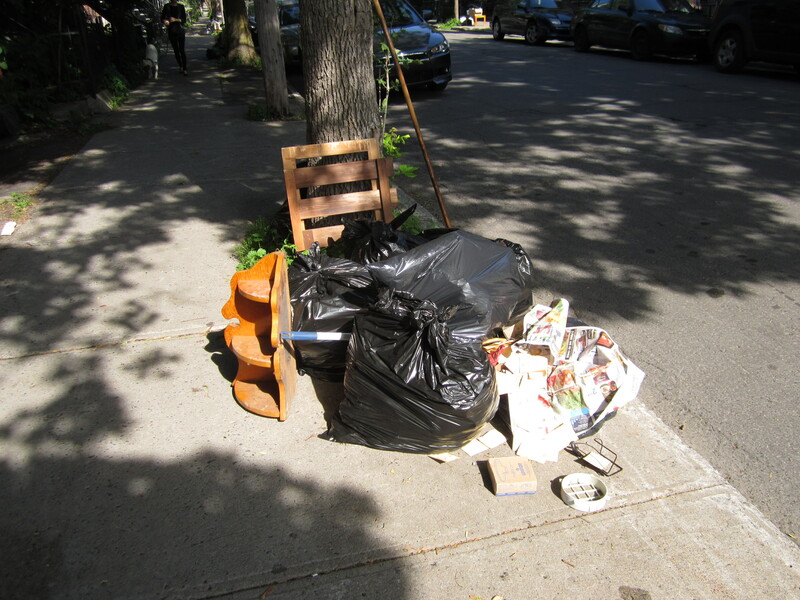 This pile was next to a moving truck that was being loaded with stuff, which (especially in Westmount) is a good sign that good trash is about! 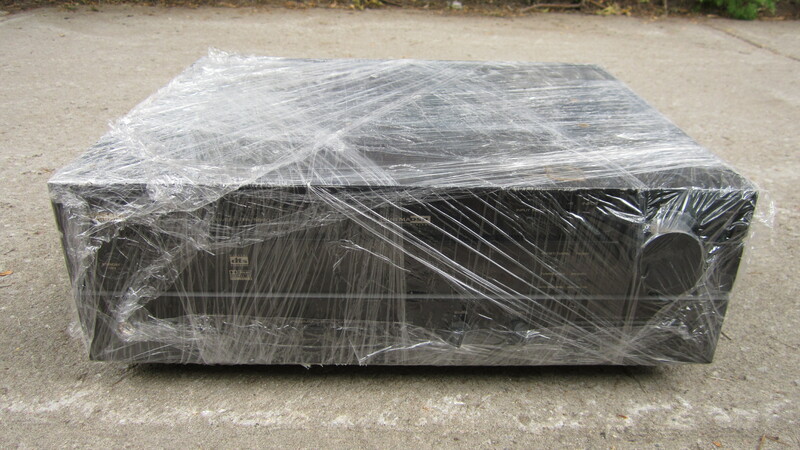 On the bottom you can see something all wrapped up in plastic. It was a nice Yamaha amp, which I assume they never unpacked since their last move. Either that, or they packed it for this move and then decided not to take it. Either way, it’s a pretty nice amp (a HTR-5560 with a remote) that I might just keep for myself. I plan on getting a record player set up once I move, so I’ll need something like this to get it going! (I’m kind of assuming that it works, since I don’t want to take it out of its wrapping just to wrap it up again, but my instincts for this are generally right). 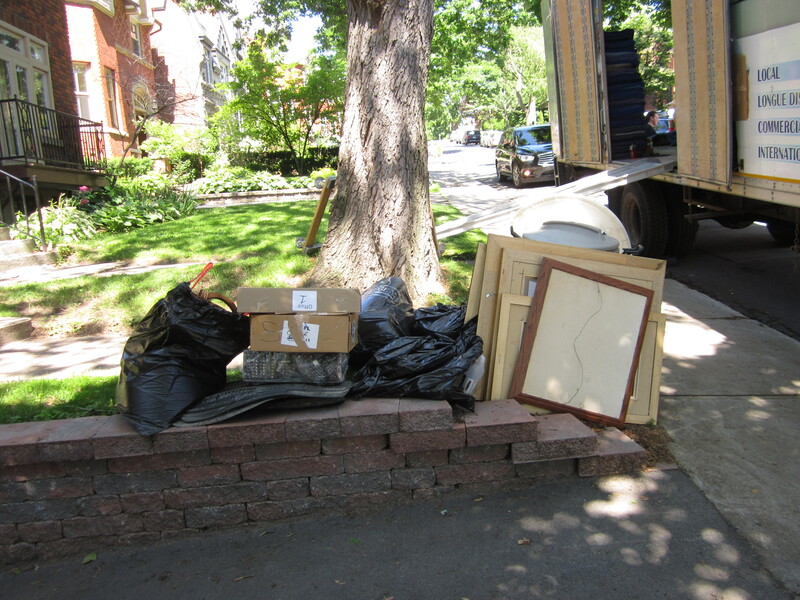 There were more things on the other side of the driveway, including a bunch of books. Someone was into dystopian fiction – they owned Fahrenheit 451, Animal Farm, and 1984. 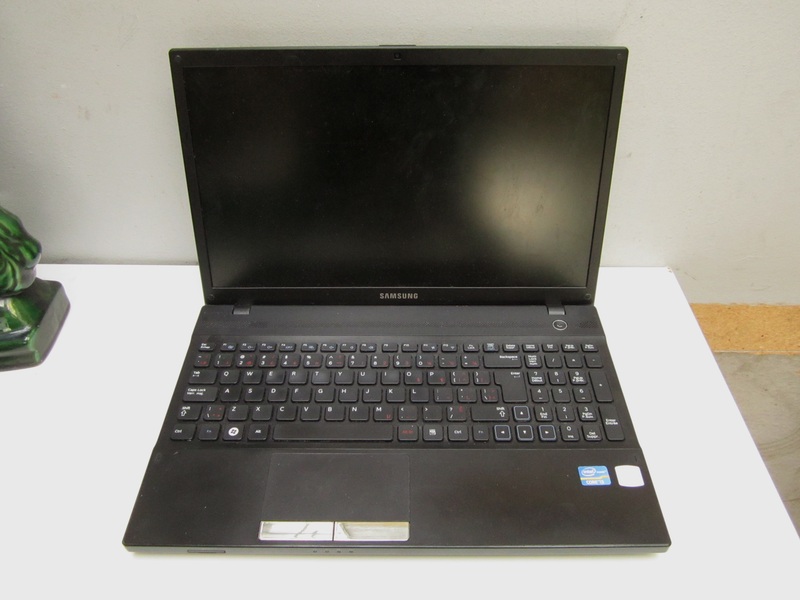 … and a busted Samsung NP300V5A laptop. The power button lights up but the screen doesn’t turn on. It should be worth a bit of money for parts though. It’s a relatively modern machine that runs Windows 7, at least in theory. So, the week wasn’t all bad. Next week should be interesting. I’m moving on the 1st and that’s going to take up some time. I’ve started packing early in hopes that I won’t get totally overwhelmed why the process. I want to do my normal slate of trash runs (it seems silly to miss the most famous trash day of the year!) and also keep up with the blog. However, if you don’t hear from me you’ll know that moving (as it often is) was much worse than I anticipated. Wish me luck! 1. 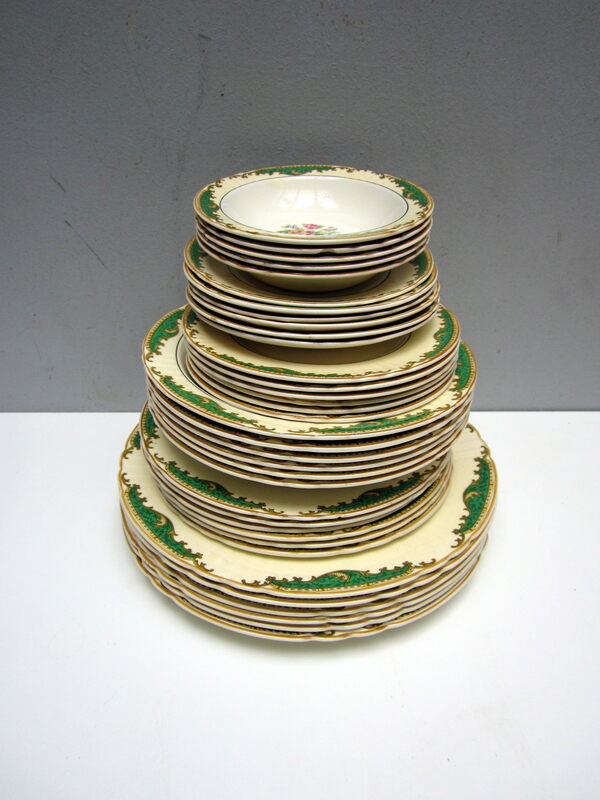 Myott china set: To a reader for 80$. This is one of things I really didn’t want to move. I’m glad to see them go to a good home! In addition to the plates and bowls there were also five mugs, a creamer, and a gravy boat. 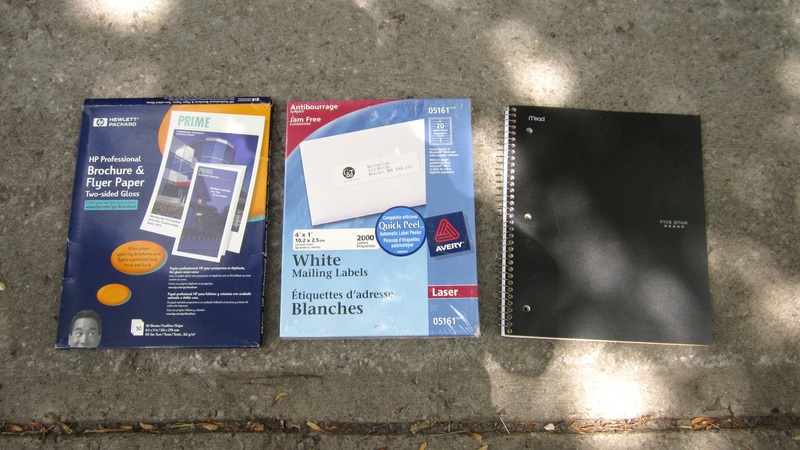 I found these early October in Ville St Laurent, on what turned out to be a very profitable day. 2. 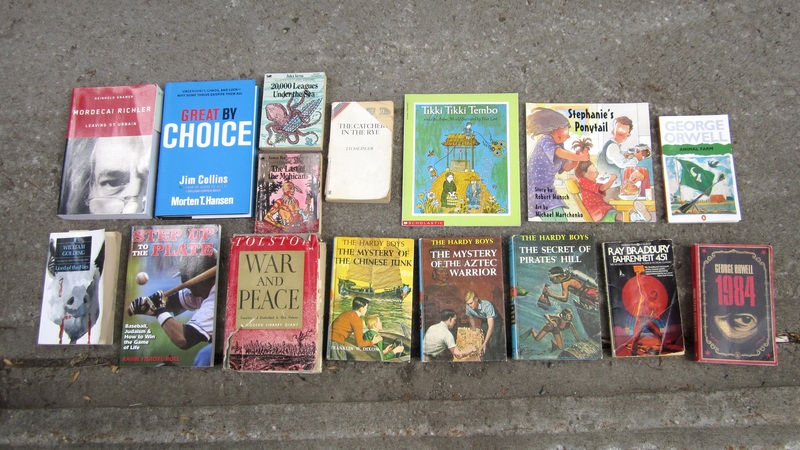 Miscellaneous WWII items: To a reader for 20$. 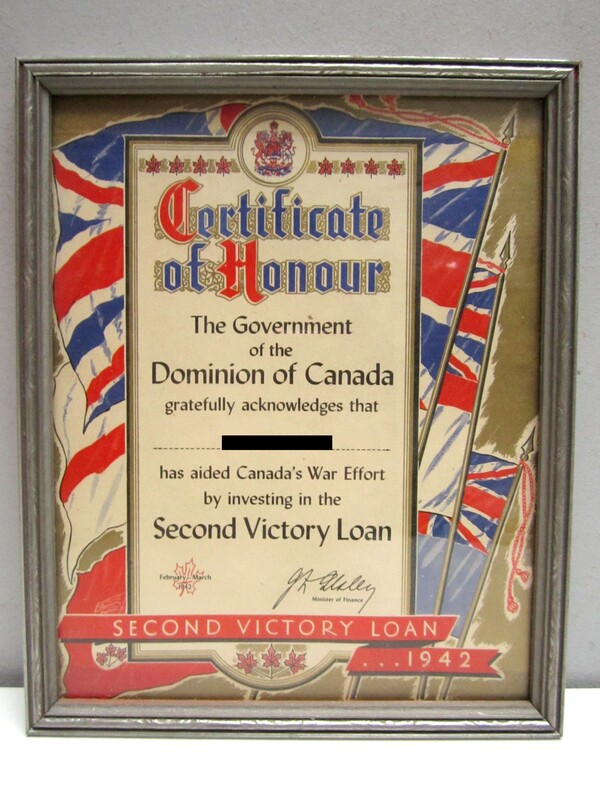 The main piece was this old Certificate of Honour that was given out for buying bonds during WWII. Found back in December in Cote St-Luc. 3. 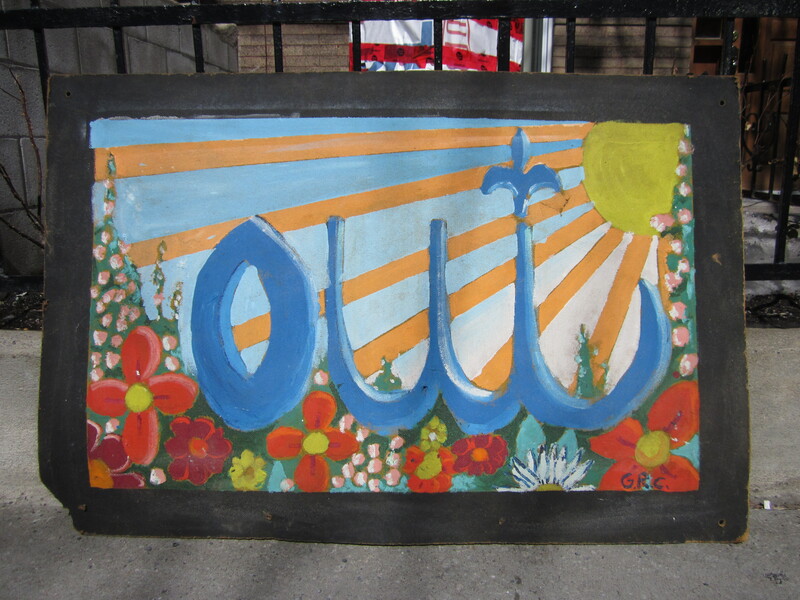 PQ election sign / folk art mural: On eBay for 130$. A couple people emailed me best offers, one of which I ended up accepting. Again, I didn’t really want to have to move it. I’m quite happy with the profit. It’s a great piece of history. It was found in the Plateau back in April after a tip from a reader. 4. 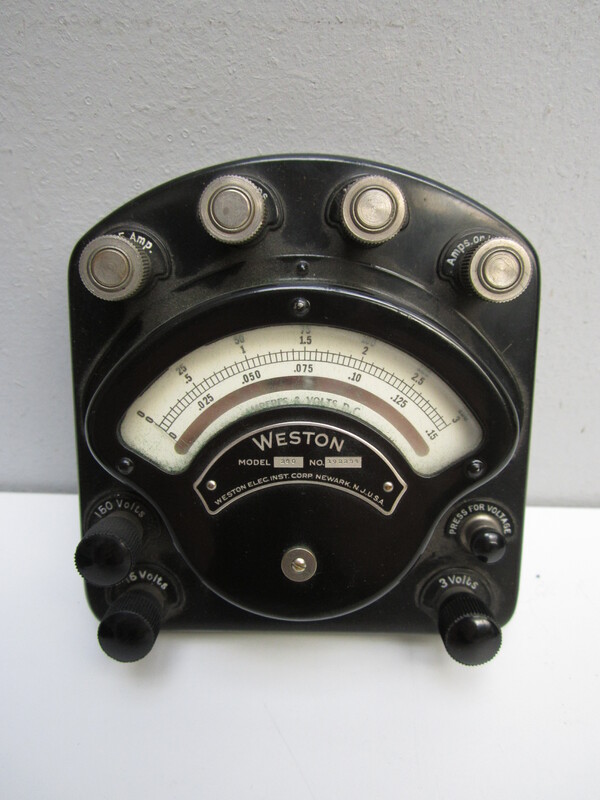 Weston Model 280 Volt-Ammeter: On eBay for 50$. I sold this as industrial decor after seeing someone else list a similar piece as such. Found in Ville St Laurent the same night as the china set. 5. Fidji by Guy Laroche: On eBay for 75$. 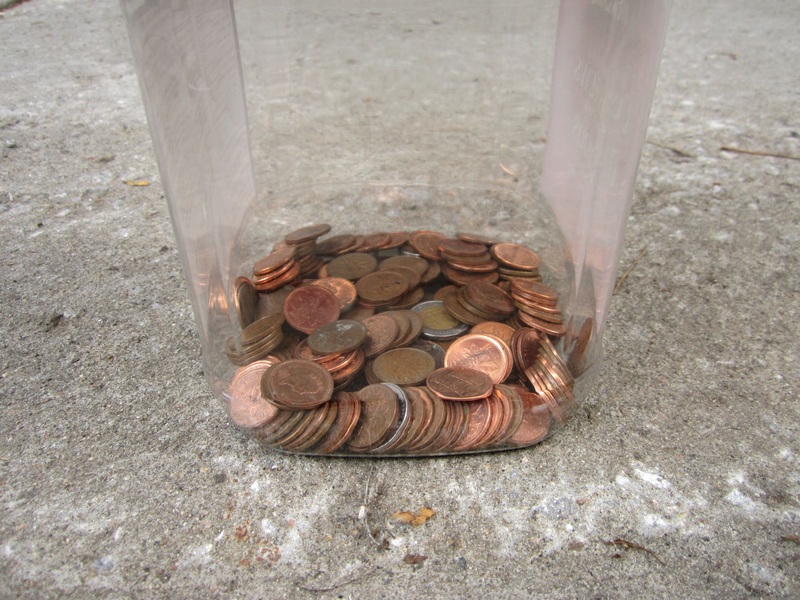 Another nice perfume sale. 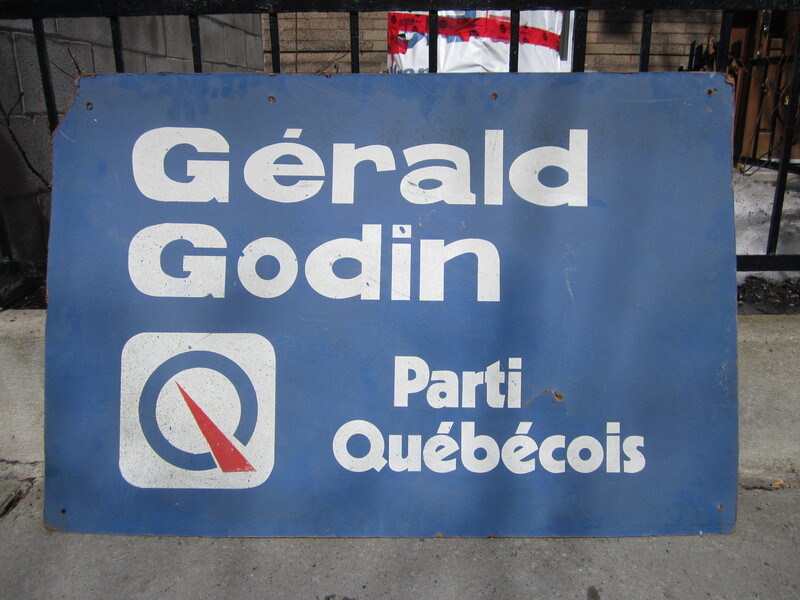 Found in Cote St Luc in March. 6. Anysley tea cup and saucer: On eBay for 50$. One down, five more to go! Found (once again) that night in Ville St Laurent. 7. 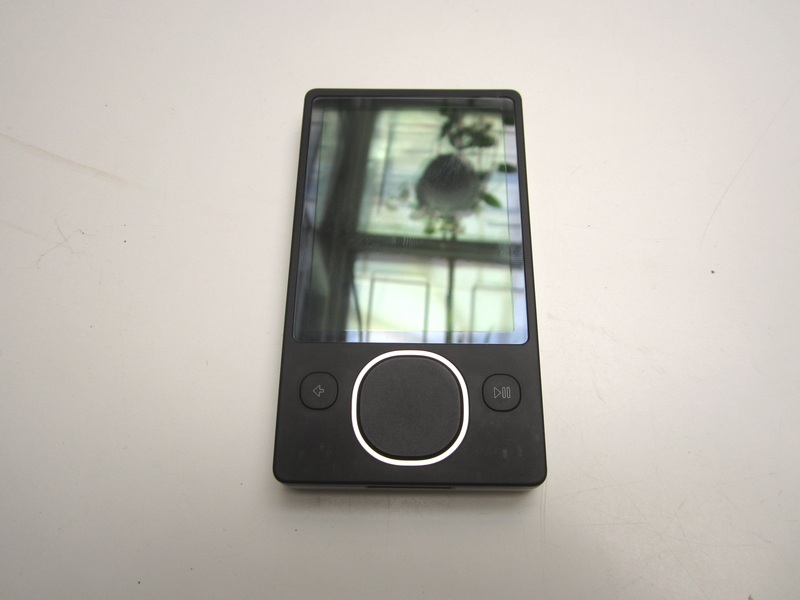 Broken 80gb Zune: On eBay for 45$. I bought a cable in hopes that it would work, but it didn’t seem to want to charge. Oh well! The cable only cost a few dollars and I was still able to sell it for some decent cash. Found around a month ago in Mount Royal. 8. 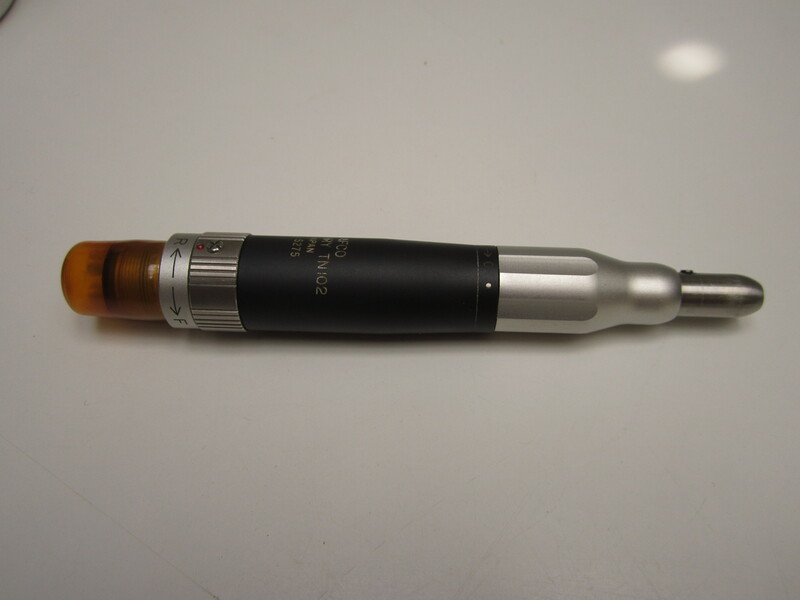 SAFCO Mercury TN102 low speed handpiece: On eBay for 74$. This is some kind of dental tool. Found mid-January in Verdun. 9. 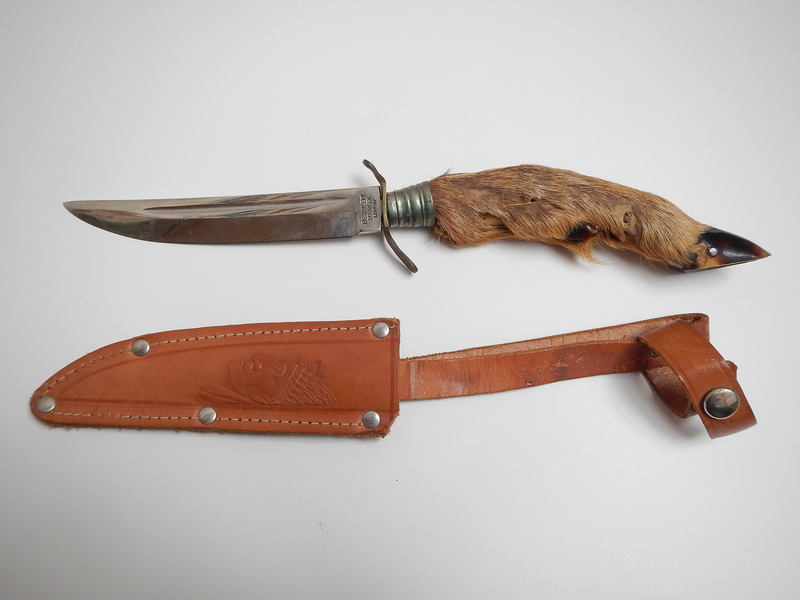 Vintage EIG Cutlery Solingen Hunting Knife: On eBay for 30$. The hoof handle had fallen off when I found it but I was able to glue it back on. I ended up talking to the guy who threw it out and he told me that his mom gave it to him as a gift back in the 50s. Found April 2014 in Mount Royal. 10. 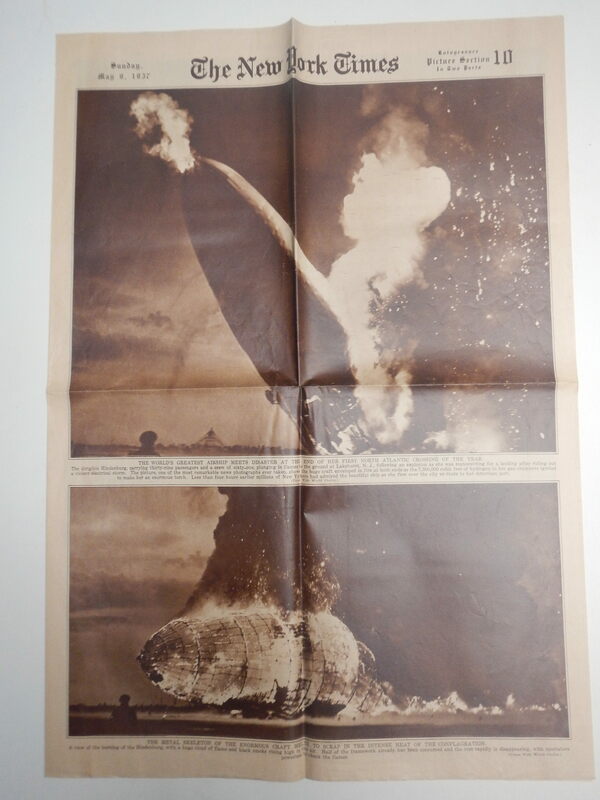 Original Hindenburg disaster newspaper: On eBay for 35$. This was a really cool find. I accepted a best offer so as to get this out the door before my move. Found August 2014 in Mount Royal. 11. 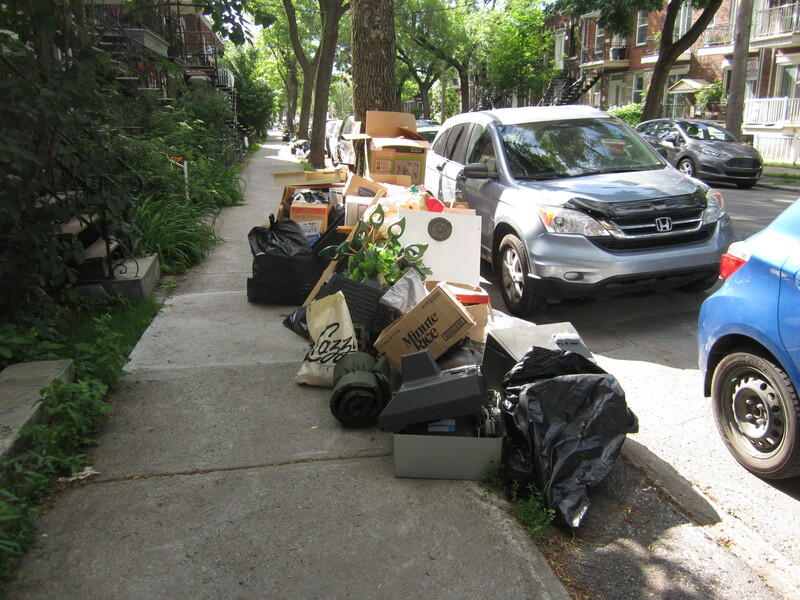 Yard sale: many different items for 195.50. A fairly profitable sale despite below-average foot traffic. I blame this on nearby St Laurent being temporarily converted to a pedestrian-only road for various festivals. I hope to do another one this weekend. Total: 784.50$, 9832.50$ since the new year began. A pretty typical total at this point in my career. Average that amount over the full year and I make a bit over 20k, a pretty good total for just selling garbage!